Smart Transit is a new show premiering in October on WYOU. Produced by Rick Richards, the show will explore public transportation in Madison and Dane County. Episode 1 was recorded in the studio today with special guest Al Matano. Watch for Smart Transit airing Friday nights at 9:00pm with repeats throughout the week. 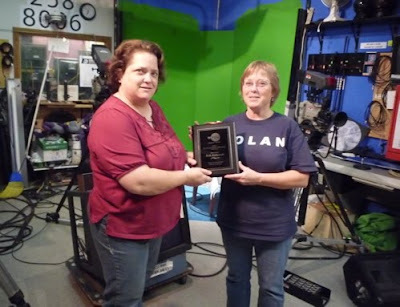 At tonight's WYOU board meeting, Executive Director Barbara Bolan presented a special plaque to honor the many hours of work that volunteer Beth Zurkowski has given to the station. Beth went above and beyond the call of duty during last spring's pledge drive, and her efforts continued to assist the station for this summer's Hands-On event. 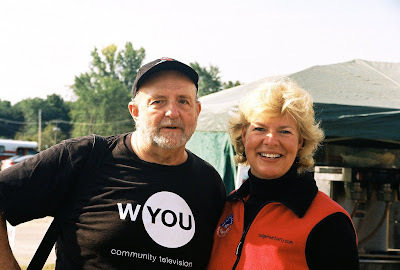 New WYOU Program Schedule is Here! We have a brand new schedule starting in September. New shows, new times, new look! Just some of the highlights include Grit TV at 7:00pm prime time directly following Democracy Now! 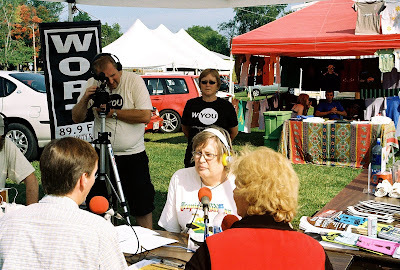 Hear in Madison a brand new local music show produced by WYOU airing at 8:00pm Saturdays. A new alternative transportation program at 9:00pm Fridays. And much much more! Most shows have repeat airings at different times throughout the week for your viewing pleasure. Go to our online schedule to see all the new changes.